Stretching 340 kilometers from Su-ao south to the Hengchun Peninsula, the Central Mountains boast many of Taiwan's tallest peaks. Nature has also uniquely endowed this area in terms of terrain, landscape, and plant and animal ecology. These natural assets and the vibrant local aboriginal culture make this area one of Taiwan's top ecotour destinations. These farms are located along the Central Mountains. 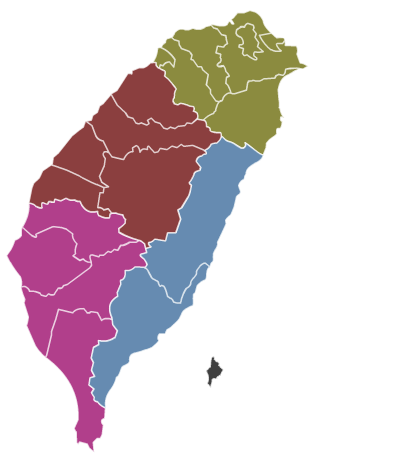 In the north are the Qilan and Mingchih forest recreation areas; in the central region are the Wuling, Fushoushan, and Qingjing farms; in the south one can find the Kaohsiung Farm in Meinong, Kaohsiung City; and in the east is Donghe Farm. These major farms invite visitors with scenic beauty and rich ecological attractions, bringing one up close and personal with the mystery and power of nature.